Durus Industrial keeps your Industrial operation running smoothly and profitably. We provide repair or replacement of processing equipment, technical maintenance, engineering relocation, structural steel, machinery guarding and more to a variety of industries including Mining, Power Generation, Oil and Gas, Dairy, Petroleum, Municipal Water Treatment, Paper and Pulp, and more. Let Durus Industrial make your next maintenance, repair or installation project a success by doing it right, doing it safely, doing it on schedule and doing it on budget! At Durus Industrial LLC, we pledge to provide distinctive quality in the service of industrial construction, repair, and maintenance with safety as our priority. Through unparalleled customer service we will strive to gain the respect and trust of our customers, suppliers and vendors. 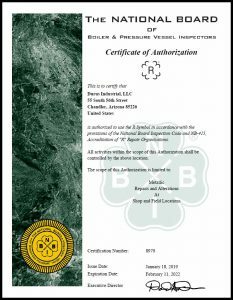 Safety, quality, competitive pricing and time efficiency allow us to ensure the satisfaction of our customers, so they continue to choose our services every time. We will maintain the highest levels of professionalism, integrity and honesty in our relationships with our customers, suppliers and staff allowing us to build and maintain long-term relationships. Continuing education, opportunities for growth, and team building, create a foundation of qualified, satisfied employees. Our success is built by knowledgeable, productive employees who are encouraged to make suggestions that can improve our organization and service to our customers. Each employee of Durus Industrial, LLC is essential to fulfilling our mission in serving our customers safely each and every day. At Durus we have a commitment to hiring quality people, invest in safety standards and train in every facet to be a model of quality and performance, ready to move at a moment’s notice for our customers. We raise the bar for ourselves daily, not because we have to, but because we know the only way to lead is by example. Durus Industrial uses a complete team effort that focuses on the success of the company, our projects, and our clients. Durus has established an internal initiative to eliminate the need for rework by extensive training and continual improvement. Our approach to Quality requires Durus to ensure project quality requirements are maintained throughout all phases of the project. We believe that “Quality starts before the work begins”. Durus Industrial supports our Quality initiatives by insuring that all processes and procedures are correct and Code requirements, manufacturer recommendations, project specifications, and industry standards are met. We have set a goal to provide the best quality in the industry and to use each job as an example of how things can, and should be done. 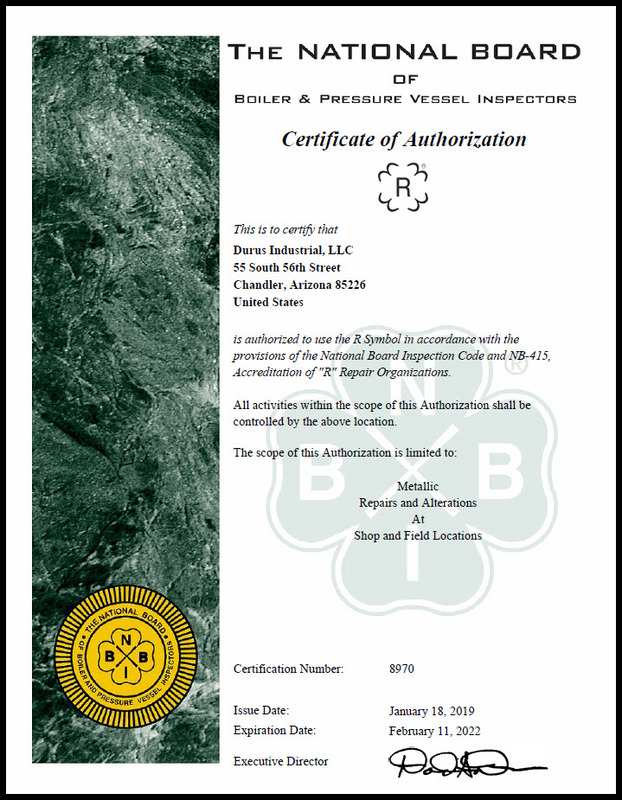 Durus Industrial is a certificate holder of the National Board R Stamp for the repair and/or alteration of boilers, pressure vessels, and other pressure-retaining items. Have a question? Give us a call or fill out the Contact Form below and one of our associates will be in touch to address your questions and concerns. Use the Form below for General Inquiries. Please use the Employment Form found in Careers for Job Applications. Enter the characters you see above in the space below. An interesting and challenging experience awaits you as an employee of Durus Industrial LLC. We provide competitive wages, strong benefits, and the satisfaction that comes with being part of a successful team. We are always looking for skilled, dedicated individuals who can help us reach our goals while providing rewarding work and pay for the employee. To download the Durus Employment Application click here. 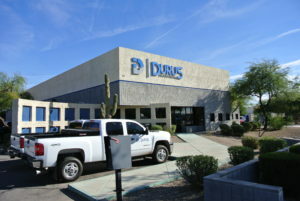 Completed applications and resumes can be email to careers@durusindustrial.com or faxed to 602-926-8982. I fully understand that the presence of and/or use of Illegal Drugs may cause my rejection from further consideration for employment with Durus Industrial, LLC. I further understand that refusal to submit to a Drug Screening Test will constitute voluntary withdrawal of my Application for Employment. Start with most recent please. Please include Employer, Type of Business, Address, Job Title, Dates Employed (from - to), Phone Number, and Duties Performed.